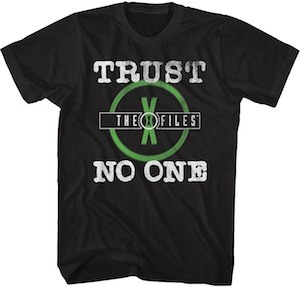 If you like The X Files then come see this Trust No One T-Shirt. This is a black pre-shrunk cotton t-shirt that comes in men’s sizes Small – 6XL so that there is an X Files t-shirt that fits you as you want it. On this t-shirt is shows a green circle with a big green X in it that is connect to text that says “The X Files” and then around that circle it says “Trust No One” and that is something Mulder and Scully tried to teach us while we all watched and rewatched the TV show they where in. So maybe wear this t-shirt to warn others not to trust anyone or maybe wear it to your work so that your boss will know what you are thinking.